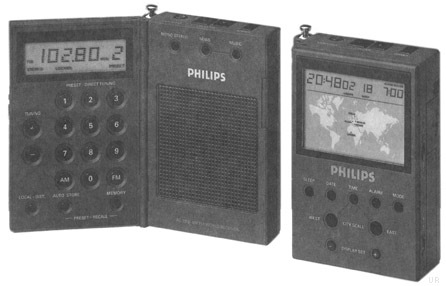 The Philips AE3905 is an incredibly compact longwave, medium wave, shortwave and FM stereo (to earphone jack) receiver. Enjoy full coverage from 170 to 29995 kHz plus the FM broadcast band. 18 memories (9 on FM band and 9 on other bands). The LCD provides 5 kHz shortwave readout. You can tune the radio via the up/down buttons, direct frequency entry or automatic scanning. Enhancements include: 12/24 hour clock-map with sleep function, 9/10 kHz medium wave step, Local-DX switch and tone switch. Requires two AAA cells of 3 VDC. 2.75 x 3.75 x 1.25 inches. Made in Austria. Supplied with system case, pouch, batteries, earphones, roll-up antenna and wrist strap.